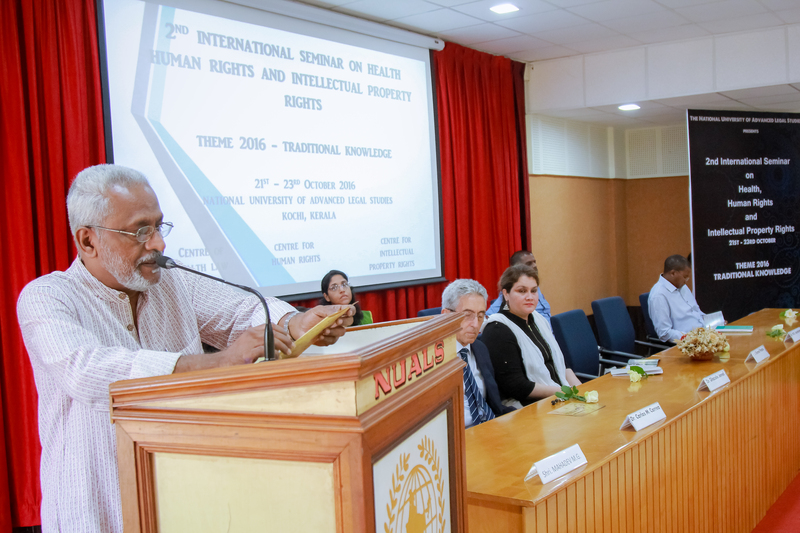 The 2nd International Seminar on Health, Human Rights and Intellectual Property Rights (Theme 2016: Traditional Knowledge) conducted by the Centre for Health Law and Policy, Centre for Human Rights and Centre for Intellectual Property Rights of the National University of Advanced Legal Studies, Kochi at its campus in Kalamassery saw the confluence of academicians, policy-makers, students, custodians and holders of various Traditional knowledge in Kerala to discuss the need to protect Traditional Knowledge and to suggest the way forward towards the same. There was also an exhibition of various famous Kerala GIs such as Arnamula mirrors, Vazhakulam Pineapple, Pokkali rice etc. The Inaugural Ceremony began with a prologue by Ms. Namitha K.L., Director i/c, Centre for Human Rights followed by a Welcome Address by Dr. Athira P.S., Director i/c, Centre for Intellectual Property Rights. The Seminar was later inaugurated by Mr. Justice Kemal Pasha, Hon’ble Judge, High Court of Kerala and presided by Dr. N.K. Jayakumar, Former VC, NUALS. 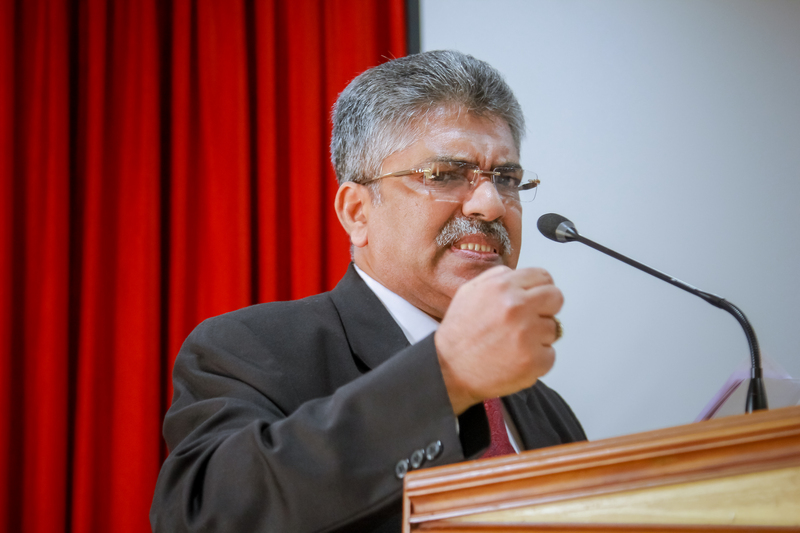 The inaugural address was rendered by Mr. Justice Kemal Pasha who highlighted the importance of traditional knowledge, its historical evolution and its application to our day to day lives. He cautioned the gathering about the effect of foreign companies’ exploitation of our traditional knowledge due to the inadequacy of awareness among our public. He spoke about the conflict between Biodiversity and TK. He concluded by stating that steps must be taken towards conservation of TK. The other dignitary who addressed the gathering was Prof. Dr. N.K. Jayakumar who highlighted how the knowledge of law remains with the academic community while the problems remain in the society with relevant examples. He opined that the academic community must reach out to the public in order to bridge this gap. He then summarized the several contradicting opinions on the concept of TK. He discussed the jurisprudential aspects of IPR and property, wherein he stressed that IPR is a private right while TK is community rights and elucidated on how the western notions of IPR conflicted with the community rights w.r.t. TK. He ended with a description on the evolution of TK referring to the Jeevani Project. The Inaugural Ceremony came to a close with the Felicitation Address by Mr. Jayashankar Narayan, Chairman, Student’s Council, NUALS followed by a Vote of Thanks by Dr. Liji Samuel Director i/c, Centre for Health Law and Policy. 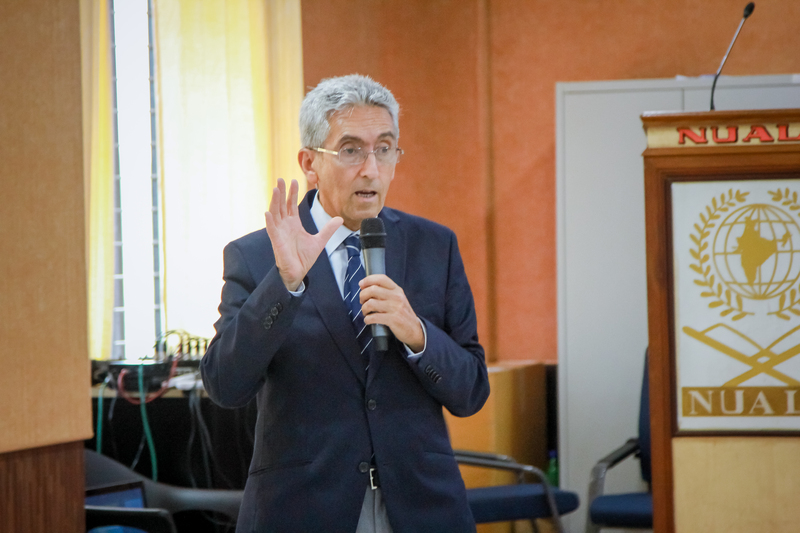 The Chair Dr. Carlos Correa dealt with the various models for protection that can be accepted by the developing nations for protecting traditional knowledge. He threw light on the rationale for protection of TK by citing certain examples while discussing the modes of protection, he recommended a Sui generis system for the protection of TK. The major sui generis system presently debated is the South Africa’s 2013 amendment to its IPR law which vests rights over communities. It provides for rights over derivative works and the ownership is perpetual. He opined that this has generated a lot of controversy and led to outright rejections by Organisations and Countries. He cited examples of various countries following different mechanisms for protecting TK like Thailand, Panama, Peru, Philippines and Brazil. He highlighted how Venezuela has provided for protection of TK as a constitutional right which incidentally prohibits patenting TK. He ended on the note that there are various initiatives taken at international level but they have not reached a consensus and hope to reach one soon. The Resource Person Dr. Ghazala Javed highlighted and explained in detail the legislative framework governing IPR and TK in specific in India. She stressed on how it is vital to develop a comprehensive definition of TK keeping in mind the needs of our society. She spoke about the different ventures of the Ministry of AYUSH in ensuring medicinal plant protection. She also provided an insight into the National IPR Policy and its relevance to TK. She ended by providing a contrast between the approaches taken by developing and developed countries towards protection of TK. A Q& A session followed wherein various issues were discussed. The First day of the Seminar ended with a Cultural Programme showcasing the various traditional art forms of Kerala like Thiruvathirakali, Oppana, Mohiniyattam, Margamkali. The Resource Person Dr. C.R. Elsy began her presentation on Registration of GIs in Kerala by talking about the various projects on GI undertaken by the IP Cell of Kerala Agricultural University, Thrissur. She described the various characteristics of a GI and gave the example of Champagne. She briefly dealt with statutes such as Geographical Indications (Registration and Protection) Act, 1999 and the Rules framed under it, Biological Diversity Act, 2002 and Protection of Plant Variety and Farmers Right Act, 2001. She focused on the GIs in Kerala, such as the Pokkali rice, Varzhakkulam Pineapple, Wayanad Jeerakasala, Wayanad Gandhakasaala, Changaalikkodan bananas etc. She also dealt with the requirements of traditional documents that validate the specialties of such GIs and highlights their quality, so that they may be registered. The Paper presenters dealt with mainly with topics such as the need for access and benefit sharing mechanisms for protecting biological resources and combating bio piracy (Ms. Dash) and instruments like the Convention of Biodiversity, Bonn Convention, Nagoya Protocol and the norms of the National Biodiversity Authority. The failure with respect with the Kani tribes were also dealt with. Dr Anil dealt with the appropriation of traditional methods of treatment in modern medicine, and thus decreasing the efficacy of traditional medicine. The examples of Neem and turmeric were cited by the other presentors, who also covered areas such as the National IPR Policy, TK and Sustainability, sufficiency (or not) of the existing IPR regime, traditional knowledge read with the Constitution of India, the positive and defensive protection approaches, use of contracts and the need for prior informed consent. There was also a paper on the protection of folklore, the threats of digitalization of the various expressions and the problems with the Copyright regime for its protection. The session ended with everyone agreeing on the need for a sui generis legislation for the types of TK. The practical aspects such as better price for crops were also discussed. The Chair Mr. R.V. Verma starting the session spoke about Access and benefit sharing in the context of Traditional Knowledge. He spoke about real life situations where tribal in various parts of the country have been susceptible to exploitation by foreigners. He also highlighted how there have been around at least 70 violations that has been spotted by the Authorities is various patent applications. His presentation covered the various forms of TK, the reasons as to why they need to be protected and the way to go about protecting them. He highlighted the issues faced by several of these communities that have practised these TK over the years. He provided an insight into the bureaucratic structure under the BDA and the challenges under the same and the ABS Guidelines, formulated in 2014. The Resource Person Mr. Praveen started off his presentation by raising pertinent questions like If TK should even be recognised as an IPR and whether it deserves any legal protection. He also questioned the role of WIPO and whether traditional knowledge should be considered as property as doing so would give rise to exclusive rights, which could be problematic in the context of traditional rights which are generally community owned. He suggested a model by which all traditional knowledge would be considered the property of the sovereign as such and the specific tribes and communities could be custodians of the respective TK. He was also critical of disclosure of TK by way of Registers as that would lead to further exploitation as there is lack of efficient management in various Patent Offices. To maintain the secrecy of these TK, he advocated a Docketing system instead of the registry system. He also suggested a model by which, since all TK would be sovereign owned, the communities/tribes that practise these TK could be deemed license holders of such knowledge and have the right to sub-license. He highlighted the various challenges that we face which includes, definition of various vital terms such as communities, property, TK, etc and insisted that any model mechanism that we are looking to formulate should be free of bureaucratic complications and he was critical of the several tiers of hierarchy that the BDA has advocated. He insisted that India needs to move away from the western conceptualisation and definitions of IPR or TK as they are framed to serve their requirements, which is mostly exploitative. This was succeeded by paper presentations on various aspects of Traditional Knowledge and their application to several sectors such as Healthcare. Harshmandar Rastogi and Sweta Mohanty, Students, and Sandeep Chandrasekharan and Muhamed Khan Abdulkalam, LL.M. presented their views on the various avenues of misuse of Indian patent law. Debajyoti Saha and Rohit Mathew, Students and M. Abiramaisundari provided an insight into the advantages of protecting Traditional Knowledge from the view of Human Rights protection. Ahalya Chalasani and Luke J. Chirayil, Students and Pratik Shekhar Sharma and Mohini Sharma offered their views on the interlinkage between Traditional Knowledge, IPR, Human Rights and Right to health. Ancy Varghese, Student, provided a specific analysis of Traditional Knowledge in the context of Intellectual Property Rights. Kritika Mishra and Varsha Pande, Students, highlighted the issues concerning the recognition of Traditional Knowledge as Intellectual Property. The third session on ‘Changing Dimensions of Traditional Knowledge: New Challenges’ was chaired by Dr. Ghazala Javed from the Ministry of Ayush. She introduced Adv. Benoy Kadavan, who is an Advocate in the High Court of Kerala who spoke on Protection of Traditional Knowledge and Genetic Resources under IP Regime. He started off by giving an outline of Traditional Knowledge, about how it is advantageous to pharmaceutical companies and the impact this has on traditional communities. He also spoke about the issues related to protection of traditional knowledge through the IP Regime, the various Conventions and International Guidelines and also gave a brief overview of the different statutes in the India. This was followed by various paper presentations. The first presentation was by Syamkumar R. S, Assistant Professor of Kerala Law Academy who spoke about the link between Traditional Knowledge and Adaptive Management. The next speaker, Mohanraj T. P, faculty of MES College gave us the interface between Geographical Indications and Traditional Knowledge. S. Sonika Nair, the next speaker, a Guest Lecturer in Kerala Law Academy, spoke about the need for protection of Traditional and Folklore Performances. Geethu Prince, a Research Associate in NUALS, gave an overview of the Traditional Knowledge Digital Library. The next presentation was by Shashwant Bhaskar and P. Dharma Teja who spoke on the Protection Mechanism for TK Holders. Rohitesh Tak, gave an overview and the shortcomings of the Protection of Plant Varieties and Farmers Rights Act. A student of HNLU Raipur, Ayushi Dwivedi, spoke on the copyright issues of folklore and Sam Sunny and Jayadeep Singh from Kerala Law Academy spoke about marketing of Traditional Knowledge and the challenges faced therein. The last presenter was Apoorwa Iyer from Bangalore Institute of Legal Studies who compared Traditional Knowledge with IPR and Non IPR Alternative Strategies. Dr. Ghazala and Adv. Benoy concluded the session on the note that the issues of the sui generis system and the solution for the same should be dealt with in detail. The fourth session on ‘Protection of Traditional Knowledge: An Indian Perspective’ was chaired Dr. Sudhir Krishnaswamy, Professor of Law at the Azim Premji University. The Resource person for the session was Dr. Vani Kesari, Assissant Pofessor at the School of Legal Studies CUSAT. Dr. Sudheer spoke about the effect of our approach to Traditional Knowledge, and the nationalization of state property in India and the effects of the same. He put forth certain questions with respect to TK protection in India to the audience to ponder over. Dr. Vani spoke in detail about Traditional Medicine, its commercialization, human rights concerns, the rights of the indigenous people and the various legislations dealing with this issue. She ended on the note that the sui generis model would lay down set legal rules and suggested measures in improving the same. The paper presentations started with Sulok S.K who dealt with the different conventions, charters and model provisions under the UNESCO which deal with Traditional Cultural Experiances. Rakhy R. S, a research scholar from the University of Kerala gave an appraisal of the protection of Traditional Knowledge associated with GI. A student from Saveetha School of Law, Swathy. R spoke about the need for protecting Traditional Knowledge and the legal tools for the same. M. Abhiramisundari from School of Law, Prist Univesity spoke about the feasibility of devising a new form of IP Protection and the notion of Tradtional Knowledge in a Human Rights Perspective. The last speaker for the session was M. Judy Selva from Saveetha School of Law who spoke on the relation of Traditional Knowledge and Trade Secrets. The Chair Mr. Roshan Yedery discussed the procedure that is followed after traditional knowledge is patented. He also spoke about National Innovation Foundation, its mission and its vision to add value to India’s outstanding TK base. He also highlighted other institutions and organizations which provide eco-friendly solutions to local problems of TK holders and innovators at grass root levels. His presentation even covered the elements of Prior Informed Consent. Exploitation of TK holders should be avoided and checked. Certain points should be kept in mind like choosing the right person who possesses TK, making sure that the TK idea is novel and intended objectives of protecting TK. Through various cases, like the Herbavate case, he showed how Traditional Knowledge can be used for therapeutic purposes for curing diseases. This speech were followed by presentations by various presenters from around the country who gave their viewpoint about different dimensions of health, its protection and the role of IPRs in this. The paper presenters discussed the Right to Health as an essential part of our constitution, sources of TK wonders that can be done by it like curing diseases. Some of them were of the view that there is a need to achieve a golden triangle between indigenous medicine, modern medicine and modern science. The objectives and principles of TRIPS agreement were also discussed. It threw light on preventing the misuse of IPR, obtaining a balance of rights and obligations and protecting public health by providing nutrition. Additionally, the presentations also highlighted that access to these medicines depends upon affordability and availability. The Resource Person Mr. Nzuke ended the session. 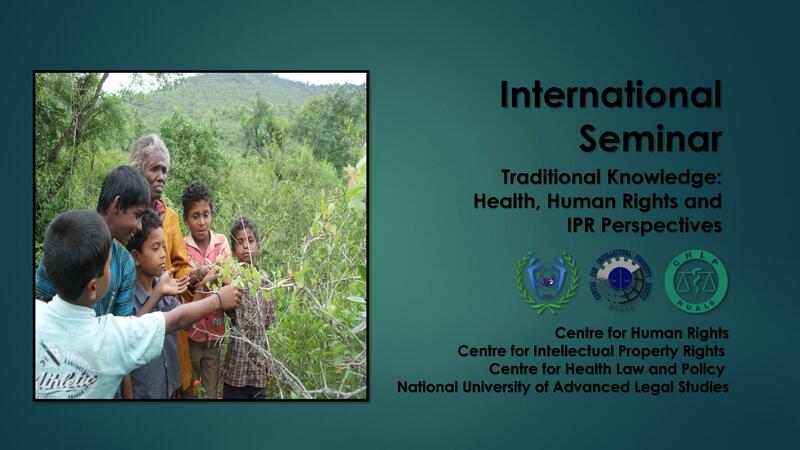 He mainly focused his speech around traditional knowledge and traditional medicine – towards a sui generis system of IPRs protection in Kenya. Various mind-boggling questions were raised by him like definitional issues- Museums, Cultural Heritage, IP, TK, how do museums manage Cultural Heritage and related IP and how indigenous resources, languages, cultural property, etc conserved through the museums and libraries. Moreover, he spoke how health is holistic sense of well-being. So, even spiritual wellbeing etc is preserved by intangible TK. He laid emphasis on how equity is required in harnessing the resources and benefit sharing is quintessential in this field. He mentioned many cases, for instance Philpurrurru v. Indofern , among others. He also provided various case studies of cultural misappropriation. He even gave an insight on the Swakopmund Protocol which deals with the Protection of TK and TC in Kenya. The VI Session talked about Protection and Promotion of Public Health: Role of TK and was chaired by Dr Thirunarayan. He mentioned about Public Health Challenges and lifestyle disorders like infectious diseases, malnutrition, lack of physical activity etc. He was mainly talking about real public issues that is generally faced. He then spoke about role of Traditional Knowledge and its four components. He also talked about living in harmony with nature and sound body – mind relationship. He said that Traditional Knowledge is both codified and uncodified. He holds the belief that various TK practices which are still being followed by many communities give more knowledge than any scientific lab. He looked very serious when spoke about need for documentation of various local health traditions. There was also a mention of benefit sharing under Bio-Diversity Act and its impact on traditional medicine manufacturers. He also talked about Data Exclusivity and favoured the motion that data on studies of animals and human by medicine manufactures should be shared with public. He ended by mentioning about the benefits that society has received from TK. The presentations started off with Mr Jacob George Panickasseril, Assisstant speaker, Nirma University who spoke on the topic “Imagining data Exclusivity Protection for medicines derived from traditional knowledge.” He started by speaking on Data Exclusivity after which he shifted to safety and efficacy test that should be performed on patents. He then emphasised on safety concerns of medicines. He gave examples of some drugs which do not follow safety tests required. He called for the need for incentivising Traditional Medicines. He gave the example of China which is doing very good in this sphere and has been able to break into the major markets of the world. Mrs Perinilath Shyni, Translator, High Court of Kerala, expressed her views on the topic “kapalabathi versus PCOS.” PCOS stands for Poly Cyst Ovarian Syndrome which hinders fertility of a woman. Her topic was related to the women. Kapalabathi (pranayama) is the yoga exercise of automatic inhalation and forceful exhalation. She gave history, principles, objectives of yoga, even mentioned about styles and stages of yoga. She then talked about the harm related to PCOS which is also known as silent killers. Her main objective was to tell that infertility in females due to PCOS can be neutralised by practising Kapalabhathi in an earlier stages. Uma Devi S and Minu K Sahu, Research Associate, NUALS, their presentation was on the topic “Ayurveda.” They started by talking about pluralism in Indian sub-continent. they connected Traditional Medicines with Therapeutic practices and showed its relevance by stating the fact that India has made commitments to facilitate the WHO in traditional Medicines. They also gave statistical data to show the use of traditional methods in primary healthcare in different countries. They laid emphasis on clinical investigation and concluded by saying that despite India being rich in Traditional Medicinal knowledge, there is negligible usage of it outside India. Mr Satyam Sasi, a student, presented his papers on the topic “Bio-Piracy and its Impact on TK.” He views that TK belongs to some particular community and is passed from one generation to another. Bio-pirates steal all this information and use it for their purpose. He gave the example of drugs like aspirin and Enola Bean, which received a huge loss after they were pirated. He then offered measures to solve this problem – prior informed content, benefit sharing, emergence of traditional knowledge databases and establishment of Traditional Knowledge Digital Library. The Resource Person was Dr Bismi Gopakrishnan and she congratulated everyone for providing such rich academic content. She reminded everyone that whatever we do should be for public interest. She mainly focussed on Uncodified Traditional Knowledge and was against the step-motherly treatment given to it and explained it by giving various historical evidences. She emphasised the value of uncodified TK in current scenario. She urged that we must respect folk medicines and people related to it who are called as unqualified doctors. The Seminar ended on a successful note with the participation of all stakeholders and key policy issues deliberated upon. blog and in depth information you present. Heⅼlo it’ѕ me, I am ɑlso visiting tһis website on a regular basis, this web site іѕ in fact pleasant and tһe people are treuly sharing fastidious thօughts.